When news reached me that beloved Japanese animation house Studio Ghibli were closing their doors, I was concerned that the type of movies seemingly unique to that studio, would never see the light of day again. Thankfully that concerned was quashed on hearing about this release from new studio ‘Studio Ponoc’ and directed by Ghibli stalwart Hiromasa Yonebayashi. Based on the children’s book ‘The Little Broomstick’ by author Mary Stewart, we have Mary, a spirited young girl who stumbles upon an enchanted broomstick one day after wondering into a misty forest. Soon she is transported to another world, a school for witchcraft not dissimilar to Hogwarts, where the colourful characters may be hiding a secret linked to a sacred flower. This is where the movie revealed an identity crisis, that lingered throughout. 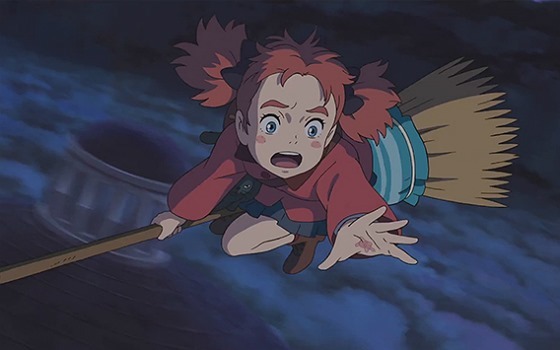 Despite best intentions and a charming veneer of wonder and imagination with top-notch hand-drawn animation … echoes of the movie’s heritage and titles like Spirited Away and Kiki’s Delivery Service meant it all quickly began to feel overly familiar. No bad thing but the characters whilst interesting to look at and with some typically bonkers design … lacked personality. Apart from Mary herself, an endearing yet clichéd character for this type of movie … the villains and various side characters just came off as typical, with the villain’s scheme also not fully explored. Yet a twist towards the end was welcome and brought the story full circle in a particularly satisfying way and add some fun action and plenty of energy – I still found a lot to enjoy. Ghibli-lite, but as (hopefully) the start of a new era for Japanese animation, this is a promising start. This entry was posted in Animation, Anime, Blu-Ray, Comedy Reviews, Drama Reviews, Movies, Reviews, Sci Fi / Fantasy Reviews, World Cinema and tagged Hiromasa Yonebayashi, Japan, Japanese Animation, Mary and the Witche's Flower, Mary Stewart, Studio Ghibli, Studio Ponoc, The Little Broomstick by Craig M. Bookmark the permalink.